patch andi: More patchwork on the bed!! We now have a patchworked artwork above the bed, a quilt on the wall, a quilt on the bed (of course) and now patchworked cushions too! Thanks to Malka for the hand made charm squares. Can't wait to see your new fabrics up close and personal. I love the fabric. I have A Stitch in Color at the moment and loving it. I'm (still) making a quilt using those fabrics. It's on my list of things to do these holidays. It's been a WIP since the summer holidays. malka is so inspiring. those cushions look great! Oh! I love these so much! 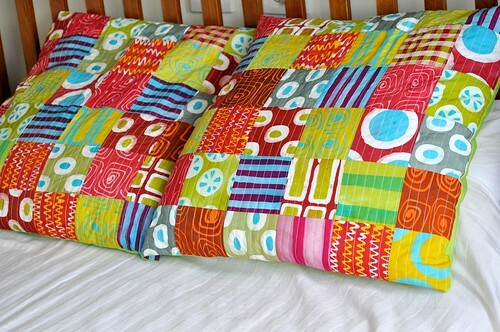 An entire patchworky bedroom - something to really love about that, I think! Hooray for husbands who put up with our obsessions! I love, love, love your cushions! I have some of Malka's fabrics that I would love to use, so thanks for the inspiration! Thanks for all your help today Andi, you are indeed the queen of patchwork. lovely pillows! and malka's upcoming line is just wonderful! I simply cannot wait for Malka's fabrics to come out!!! These are delicious! inspires me to create !